Search the listings of Top Tattoo Parlors in North Carolina. We have a complete list of Top Tattoo Parlors available in North Carolina. Review their services and if you have used them before add your own tattoo shop review. Still looking & searching around for the top tattoo parlour in North Carolina? With Top Tattoo Parlour's support, you will most definitely discover a tattoo shop in North Carolina that will cater to your desires. Top Tattoo Parlors is here to assist you on making the best choice. Surf through our North Carolina listings and obtain all the details you need on any tattoo designer or shop in the state of North Carolina. 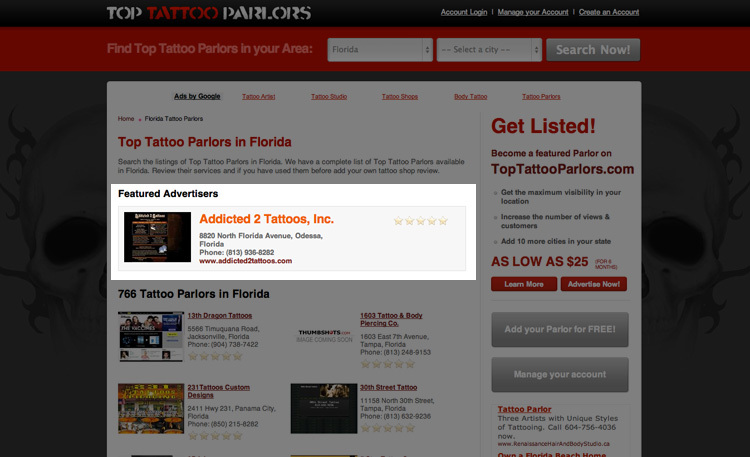 We are bringing you the biggest database along with the reviews and addresses of every tattoo Parlors in North Carolina. We are also offering you a unique chance to discover everything you need to know about the rates, and to obtain all the other essential details. Visit Top Tattoo Parlors for North Carolina tattoo shops and artists and pick the right one wisely.